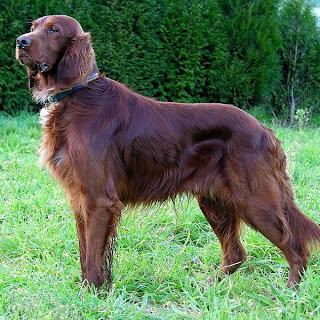 The Irish Setter, also known as Red Setter, is a robust and brainy dog, always active. It is a breed of gun dog and family dog and is strong but at the same time quite sensitive. It is a very adorable breed and normally the words fun, frivolous and adamant are used to describe this specific breed. Being an active and dynamic breed, the Irish Setter and fond of running and thus should be kept indoors. Otherwise they would run off and may be hard to catch. And at the same time it is advised not to have them in an average house ad they tend to cause damage if left alone. This breed needs strict and continuous training along with entertainment if you desire them to behave well and be respectful. Irish setter needs regular exercise, at least 3 walks per day in order to avoid restlessness in the dog. This breed is apt for county environment or a house with medium to large size ground as it is a free spirited breed and needs space to run around. It is suitable for hunting and water sports. Since it is a breed with smooth and feathered coat, regular brushing is necessary to avoid the coat from being tangled and also to keep it flat.